Fabricating a custom printed circuit board is not always an option for PCB hobbyists. Whether it is due to the fabrication price or just because of a simple demand, compared with the DIY PCB board, PCB design is really time-consuming. They are often referred to as the Dot board or Vero board in the market. A simple DIY PCB board consists of a evenly placed standard 1mm or a custom diameter hole with solder or copper pad to solder components on it. The hole is aligned with standard pin spacing to accommodate components. The interconnection is done by jumper wires or solder bridges, sometimes flexible multi-stranded lines are used for interconnection too. The board itself has a variety of variants and different sizes. The more common dot boards includes a copper-line DIY PCB board whose straight copper line runs through the entire board and cover a row of holes. This is much like a breadboard, but there is a greater number of interconnected holes. The DIY PCB board uses a completely IC-based circuit assembly and a digital circuit structure that requires a large number of direct pin-to-pin connections. 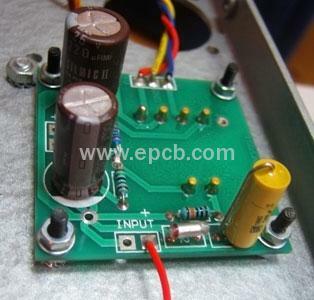 Double-sided DIY PCB board is available used to expand its usability. These boards are simply integrated through vias. Double-sided board contains holes with solder or copper pad on both ends. DIY PCB board suits through-hole components best, because SMD components have a variety of special needs of the package and size that require dedicated solder pads and are more difficult to integrate into the DIY PCB board. These boards are mainly used for prototyping, not for practical applications due to its lower circuit rigidity and reliability compared to dedicated PCBs.